Lifetime Warranty: Sulphur Grove Tool warranties the tire against manufacturer defects for life. 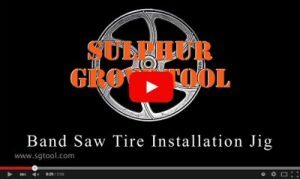 Sulphur Grove Tool will repair or replace the tire for only the cost of shipping. If your tire breaks or begins to separate at the weld, just call for an RMA number and return it to Sulphur Grove Tool. This warranty does not cover misuse, improper saw operation or damage caused by improper installation. Tires must be registered within 30 days of purchase using the form below and purchased from Sulphur Grove Tool or an authorized Sulphur Grove Tool Distributor. Lifetime Replacement Policy: Sulphur Grove Tool will replace your tires for life for any reason at 70% of current list price plus shipping. Just call for an RMA number and return the original tires to Sulphur Grove Tool. Tires must be registered within 30 days of purchase using the form below and purchased from Sulphur Grove Tool or an authorized Sulphur Grove Tool Distributor.